With high-bandwidth memory in the bag and cutting-edge processor technology finally appearing on the horizon for graphics cards—all GPUs have been stuck on 28nm since late 2011—AMD’s gearing up for a major fight against Nvidia in 2016. But the nuts, bolts, and transistors are only part of the equation with modern-day graphics cards; the recently created Radeon Technologies Group is rolling out the rebuilt-from-the-ground-up software Radeon Software Crimson to accompany the new breed of AMD hardware. AMD’s first tease of Crimson was a run-through of the slick new Radeon Settings hub designed to replace Catalyst Control Center. (R.I.P.) 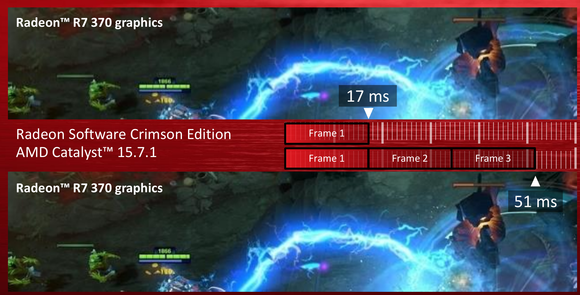 At the time, AMD revealed some of the overt new features in Radeon Settings, such as per-game OverDrive overclocking settings and one-click Eyefinity multi-monitor configuration. On Tuesday, AMD’s unwrapping the deeper-level goodies in Radeon Software Crimson—with handy features for new and old graphics cards alike—and pushing the drivers live so you can try them out for yourself. Let’s take a look at what’s on tap. And remember: These new tricks build atop the features already introduced in Catalyst Omega and the Catalyst 15.7.1 drivers released in the past year, so you’ll still find goodies like Virtual Super Resolution and FullHD to UltraHD Video Scaling intact. First up: Smoother, faster loading games. Radeon Software Crimson offers a new “Shader Cache” option that reduces stutter and can launch your games up to 33 percent faster than last year’s Catalyst Omega drivers, AMD says. The feature can be enabled on a per-game basis inside the game-specific options in Radeon Settings’ new Games hub. AMD claims that Star Wars Battlefront load times on a Windows 10 system with a Core i7-5960X, a Radeon R9 380, and 16GB of DDR4-2666MHz memory improved by 5.7 seconds with the Shader Cache enabled, while Witcher 3 played smoother on another system with Shader Cache active. Speaking of speed, AMD says that displays initialize up to three times faster with Radeon Software Crimson than they did with Catalyst Control Center. In case you missed our initial coverage, the Radeon Settings software itself launches up to 10 times faster than Catalyst Omega does, though that will vary depending on your system setup. AMD’s new software can also optimize the flip queue size—basically, how many frames are calculated in advance before being displayed—to reduce latency in games when every split second counts, most notably e-sports. Fewer precalculated frames means more responsive gameplay. Nvidia rolled something similar out with the GTX 950, which is targeted toward players of Dota 2, League of Legends, and the like. It’s nice to see AMD offer something similar. A visual representation of optimized flip queue size. But what if you want to sacrifice speed for vastly increased power efficiency? AMD’s Frame Rate Target Control lets you cap the maximum frame rate output of your GPU, so that it doesn’t waste power rendering frames you won’t notice anyway. (For example, when your graphics card can output 90fps in a game, but your monitor only supports 60fps.) FRTC proved wildly successful in our testing, and now AMD’s bulking up the feature. Whereas before FRTC only worked with DirectX 10 and 11 games and was capable of limiting frames to between 55fps and 95fps, the new software embraces DX9 titles, and the frame rate limits are being expanded to between 30fps and 200fps. Awesome. FreeSync, AMD’s brand for game-smoothing variable refresh rate display technology, is spreading its wings too. VRR gives you a super-smooth gameplay experience inside of predefined frame rate windows, such as 45fps to 75fps. If your frame rates fall outside those windows, the VRR isn’t active, and the results can be particularly nasty below the minimum VRR refresh rate. Nvidia’s proprietary G-Sync solution has long handled sub-optimal frame rates in a superior fashion, by doubling or tripling individual frames in order to maintain the smooth look without nasty flickering effects, leaning on the G-Sync module in the display for help. What happens both inside and outside FreeSync’s VRR window. Note the new behavior with Low Frame Rate Compensation. FreeSync support is also being extended to DX9 games, like the aforementioned e-sports titles and Skyrim. 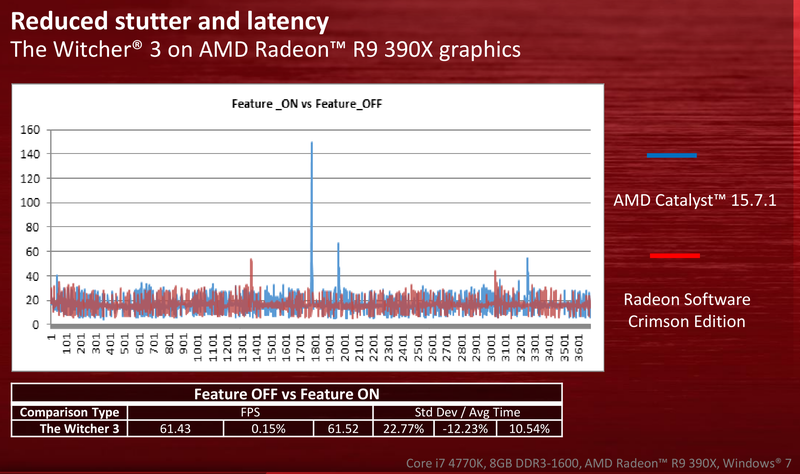 Speaking of DX9, Radeon Software Crimson also extends AMD’s Frame Pacing for multi-GPU CrossFire setups to DX9 games. Multi-GPU setups are complex beasts, with each graphics card rendering every other frame in full. A few years back, that resulted in nasty stuttering on many CrossFire setups. Frame Pacing fixed that, and it’s great to see it bring DX9 titles into the fold. An example of the smooth frame pacing in Skyrim with CrossFire’d R9 Fury X graphics cards now that Frame Pacing is supported in DX9 games. Wrapping up the gaming front, Radeon Software Crimson also includes performance improvements for the latest games and various optimizations for the new DirectX 12 technology found in Windows 10. The first DX12 titles are just around the corner, folks. Linux driver performance has also been improved for many games. That’s great to hear—though a bit weird, given that AMD’s announced Crimson support only for Windows 7, 8.1, and 10. Linux performance is a glaring sore spot for AMD, though the new unified Linux driver architecture it’s working on will hopefully alleviate the problem even further. Radeon Software Crimson’s new features and performance tweaks don’t focus on games alone, however. 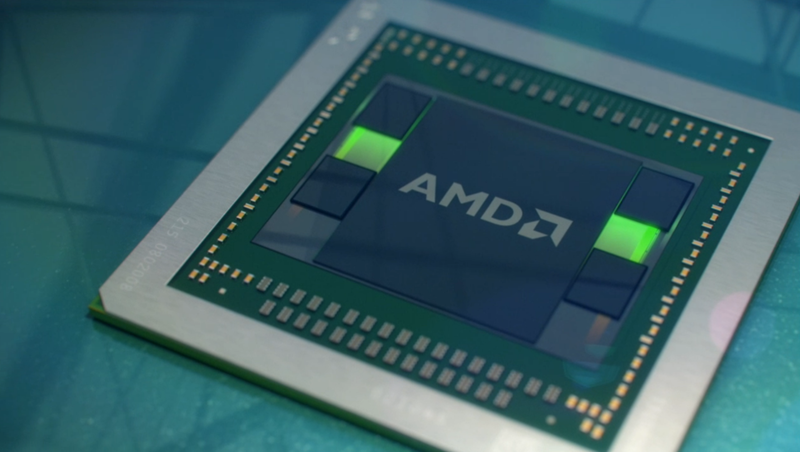 AMD’s latest sixth-generation APUs gain some new video tricks. Not only will video look smoother, with less motion blur, AMD says new Advanced Detail Enhancement technology in the drivers will sharpen images further as well, building on the 1080p Detail Enhancement introduced in last year’s Catalyst Omega drivers. 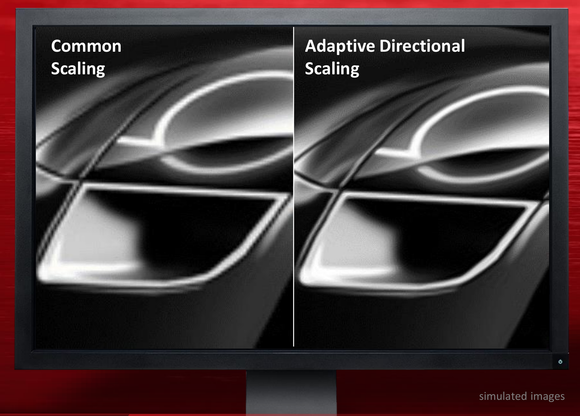 An example of scaling an image to 4K resolution without directional scaling (left) and with directional scaling enabled (right). The AMD A8-8600P and higher APUs and Radeon R9 380 and higher GPUs pick up an updated dynamic contrast ratio algorithm, while the Fiji GPU-based Radeon Fury, Fury X, and Nano graphics cards have a new directional scaling feature that more intelligently scales 1080p and 2K imagery to fit 4K screens. The goal: to eliminate the nasty “staircase effect” common when up-scaling images to higher resolutions. Beyond new features, Radeon Software Crimson lets you deeply tinker with your displays: setting custom resolutions, timings, refresh rates, and pixel clocks for each screen in your setup. 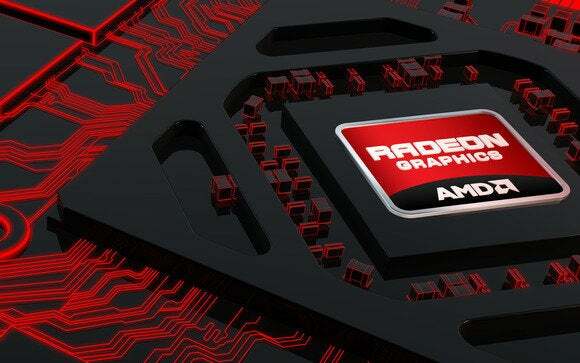 AMD’s also investing in heavy quality assurance testing for Radeon Software Crimson. The company was already proud of the deep level of testing that went into last year’s Catalyst Omega driver. AMD says it conducted far more testing than that to help ensure Radeon Software Crimson’s stability, with 100 percent more automated testing and 25 percent more manual testing across 15 percent more system configurations. All in all, AMD’s doing everything it can to dispel the perception that its drivers are lacking in comparison to Nvidia’s GeForce drivers. New Radeon Technologies Group head Raja Koduri has been beating the drum about the importance of software as part of the overall Radeon experience. Now that you’re done reading up on the deep level improvements, don’t forget to check out PCWorld’s visual tour of AMD’s new Radeon Settings hub, complete with talk about per-game overclocking and the companies approach to new drivers going forward.